Dec 10, 2016: What turntable to buy? Apr 24, 2017: Gerard Way/DC Comics "Young Animal" Record Store Day Release! May 02, 2017: Amp with headphone jack? Or is another piece of hardware needed? 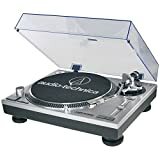 Nov 28, 2017: Anyone interested in a Audio Technica Vinyl Player? May 05, 2018: If I have a pair of ATH-M50x, would my music sound any better when my cans are plugged into my PC's motherboard vs. a record player and amp? Nov 24, 2018: What speakers should I get for an AT-LP120?